Why did Paul persecute Christians when his teacher, Gamaliel, was against it? Was Paul "converted" or "called"? Are the "new perspectives on Paul" true to the evidence? Why was Romans so important as a statement of Paul's "gospel"? Including several maps of Paul's travels and five helpful appendixes, Barnett's book is ideal for anyone interested in Pauline studies and for those seeking out the historical truth of Christianity. 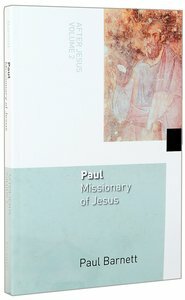 Paul: Missionary of Jesus is volume 2 of a trilogy titled After Jesus, whose first volume is The Birth of Christianity: The First Twenty Years. Volume 3 (forthcoming) is provisionally titled Finding the Historical Christ. About "Paul, Missionary of Jesus (#02 in After Jesus Series)"
Reprint under consideration. 0 Available. This book is a calculated reaction against the popular dichotomy between the Jesus of history and the Christ of faith. In Finding the Historical Christ Barnett seeks to establish that the two figures are, in fact, one and the same. [Compellingly establishes the identity of Jesus, the Christ, from historical sources. This book by Paul Barnett is a calculated reaction against the popular dichotomy between the Jesus of history and the Christ of faith. In Finding the Historical Christ Barnett seeks to establish that the two figures are, in fact, one and the same. Like his previous works, this volume by Barnett is accessible, well organized, and convincing.